Upcoming 267,387 square foot commercial building featuring approximately 237,600 square feet of office space above approximately 29,700 square feet of retail and restaurant space. Office space would be built to accommodate an open floor plan layout with abundant natural lighting and sweeping views. Communal roof terraces would be located on the proposed building's 6th and 12th floors. The upcoming building will feature a distinctive facade with sections of metal panels and glazed glass curtain wall. 550 structured parking spaces would be constructed within the building’s footprint. The building will be constructed on Assembly Row’s Block 5B, located next to the Alloy condominium and retail development steps to the MBTA Orange Line. Federal Realty Investment Trust broke ground on 455 Grand Union Boulevard at Assembly Row earlier this week with Somerville Mayor Joseph Curtatone and PUMA North America CEO Bob Philion. PUMA has signed a lease for 150,000 square feet to anchor the new 300,000 square foot retail and office building as the company’s North American headquarters. This celebration marks the launch of Phase 3 of the development, which also includes a new 24-story, 500-unit apartment building with ground floor retail space, across from the Assembly Square MBTA T station. Beyond Phase 3, Federal Realty has approximately five more acres of developable land that has been entitled to accommodate up to 1.5 million square feet of office and/or lab development. At the completion of Phase 3, Assembly Row will include over 55 shops, 22 restaurants, 1,514 residential units, over 1.1 million square feet of Class A office space, and The Row Hotel, a 158-room Marriott Autograph Collection Hotel, which opened in 2018. 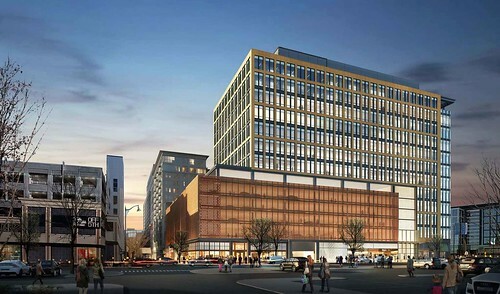 As part of Federal Realty’s partnership with the city of Somerville, Phase 3 is expected to generate approximately 600 construction jobs and approximately 900 permanent office jobs. In addition to annual taxes, the project will yield $5.6M in building permit fees and the contribution of $12M over the next several years to the creation of affordable housing in the City. Designed by Jacobs, the 13-story Class A office building with 550 dedicated parking spaces and approximately 25,000 square feet of ground-floor retail will be home to PUMA North America’s new headquarters. PUMA is expected to occupy 455 Grand Union Boulevard in early 2021 with 450 employees relocating from its current offices in Boston and Westford, Mass. 455 Grand Union Boulevard is now under construction and over 50 percent pre-leased. Cranshaw Construction is the general contractor and Copley Wolff Design Group is the landscape architect for the project. The neighborhood's existing office space at 450 Artisan Way is currently 100 percent leased. Additionally, Partners Healthcare is headquartered at Assembly Row with 730,000 square feet of office space. Federal Realty Investment Trust has signed a lease for 150,000 square feet with PUMA North America to anchor a new 300,000 square foot office building, with ground floor retail space, at 455 Grand Union Boulevard at Assembly Row, the rapidly growing, mixed-use neighborhood just minutes from downtown Boston. In addition to 455 Grand Union Boulevard, Phase 3 of development includes a new, 24-story, 500-unit apartment building, with ground floor retail space, across from the T station. Beyond Phase 3, Federal Realty has approximately 5 more acres of developable land that has been entitled to accommodate up to 1.5 million square feet of office and/or lab development. Designed by Jacobs, the 13-story Class A office building with 550 dedicated parking spaces and approximately 25,000 SF of ground floor retail will be home to PUMA’s North American headquarters. PUMA is expected to occupy 455 Grand Union Boulevard in early 2021 with 450 employees relocating from offices in Boston and their current headquarters building in Westford, Massachusetts. 455 Grand Union Boulevard is now under construction and over 50% pre-leased. At the completion of Phase 3, Assembly Row will include over 55 shops, 22 restaurants, 1,514 residential units, over 1.1M SF of Class A office space and The Row Hotel, a 158-room Marriott Autograph Collection Hotel. Federal Realty proposes to construct a new 267,387 square foot commercial building at Assembly Row featuring office and retail space. The building would be located on Assembly Row’s Block 5B, next to the Alloy mixed-use development steps to the MBTA Orange Line. Federal completed a 13-story, 825,000 square foot commercial building at 399 Revolution Drive, home to the headquarters of Partners Healthcare, at Assembly Row last June. Plans for the proposed building have been filed with the City of Somerville, who is now reviewing the project.